What I really love about Twitter is that everything they do seems to be data-based. They’re so data-driven, they even analyze the ingredients of their lunch to ensure everyone at the company is living a healthy lifestyle. So, the decision for Berlin as their German headquarter cannot be a random or value-based decision. I bet, there’s been a lot of numbers crunching before announcing their new office. Let’s try and reverse-engineer this decision. As a data basis I collected 4,377,832 tweets more or less randomly by connecting to the streaming API. Then I pulled all users mentioning one of the 30 leading German cities from Berlin to Aachen in their location field. Where there were Umlauts involved, I allowed for multiple variants, e.g. “Muenchen”, “Munchen” or “Munich” for “München”. Now I have 3,696 Twitter users from Germany that posted one or more tweets during the sample interval. That’s 0.08% of the original sample size. Although that’s not as much as I would have expected, let’s continue with the analysis. One thing should immediately be clear from this chart: Only Berlin, Hamburg and Munich had a real chance of becoming Twitter’s German HQ. 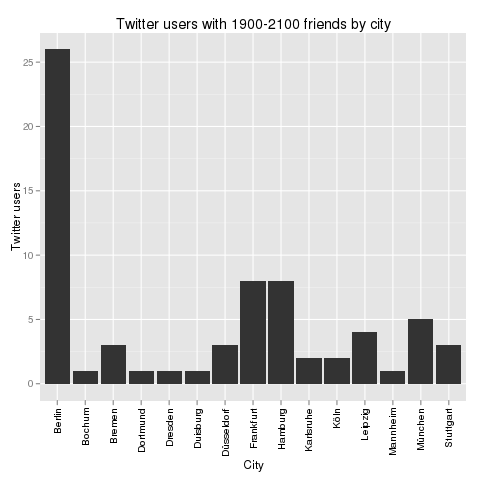 The other cities are just Twitter ghost towns. In the press, there had been some buzz about Cologne, but from these numbers, I’d say that could only have been desinformation or whishful thinking. 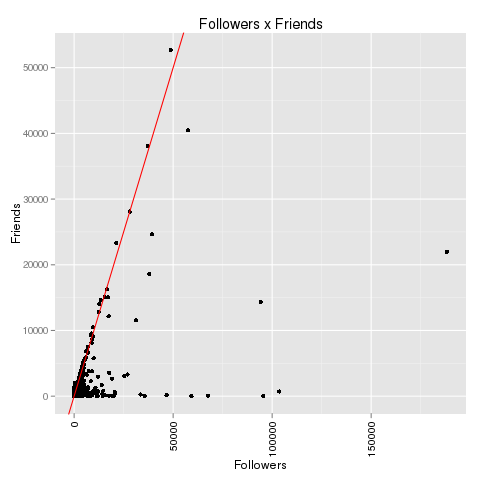 The chart not only shows the median number of followers, but also the distribution of the data. Berlin, that should be clear from this chart, is not the German city where the Twitter users with most followers hail from. This should be awarded to Bochum (355 followers), Nuremberg (258 followers) or Augsburg (243 followers). 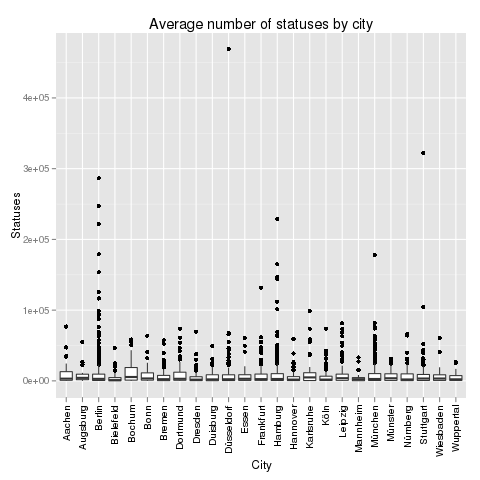 But these numbers are not very reliable as the number of cases is quite low for these cities. If we focus on the Big 3, then Berlin is leading with 223 followers, then Munich with 209 followers and finally Hamburg with 200 followers. But it’s a very close race. Next up, the number of friends. 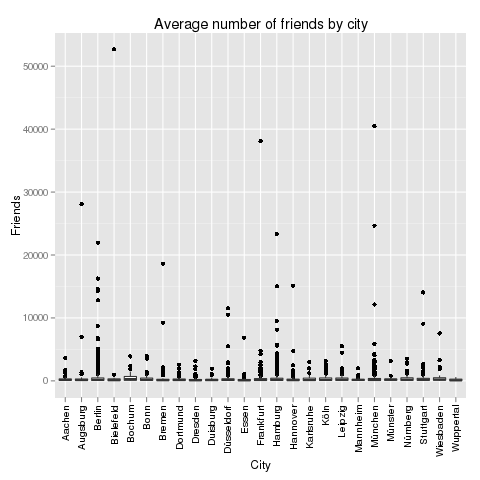 Which German city is leading the average number of friends on Twitter? There clearly is some kind of artificial barrier at 2,000 friends on Twitter. Accounts that have between 100 and 2,000 followers never follow more than 2,000 followers. Most frequently, they follow just a little below of 2,000 people. After they gathered 2,000 followers themselves, this barrier has been broken and the maximal number of friends seems to grow with the number of followers. There’s only speculation about this phenomenon, but one of the most convincing explanation is: We are looking at spam bots that are programmed to stay below 2,000 friends until they have gathered more than 2,000 followers. Maybe Twitter has some spam fighting algorithms that are focusing at the 2,000 line. 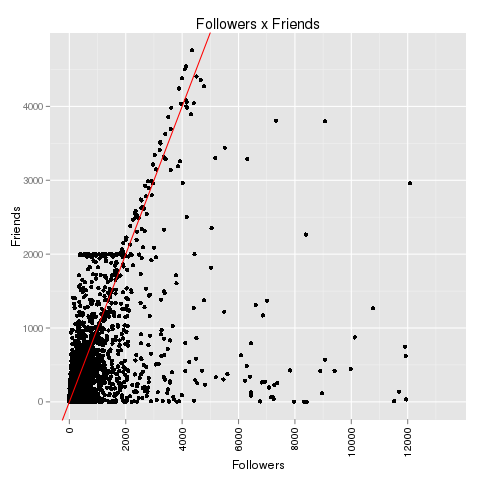 Update: See explanation in the comments to this article: Behind this anomaly is Twitter’s spam-fighting barrier that only allows 2,000 friends up to 2,000 followers. Beyond this, the limit for the maximum number of friends is limited by the number of followers + 10%. Again, Berlin is leading. But how do these numbers relate to the total numbers? Here’s the Bot Score for these cities: Berlin 2.3%, Hamburg 1.8% and Munich 1.2%. That’s one clear point for Munich. 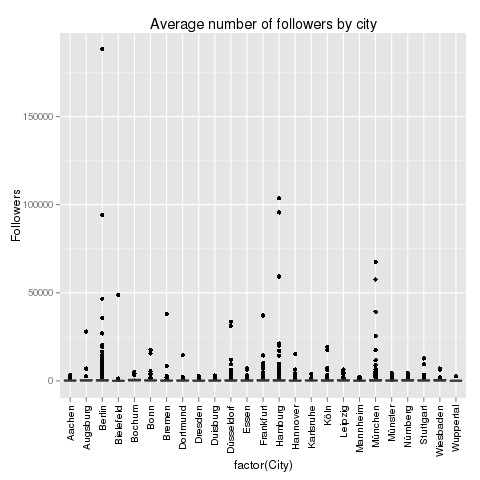 Without outliers, the most active Twitter cities in Germany are: Bochum (again!! 5514 statuses), Karlsruhe (4973) and Augsburg (4254). The Big 3 are in the midfield: Berlin (2845), Munich (2717) and Hamburg (2638). Finally, there’s always the content. 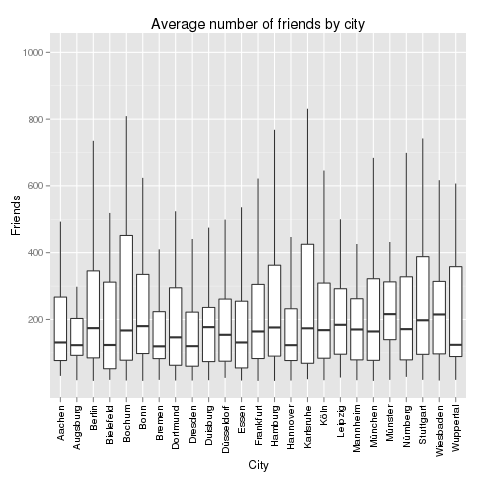 What are the users in the Big 3 cities talking about? The most frequently twittered words do not differ very much. 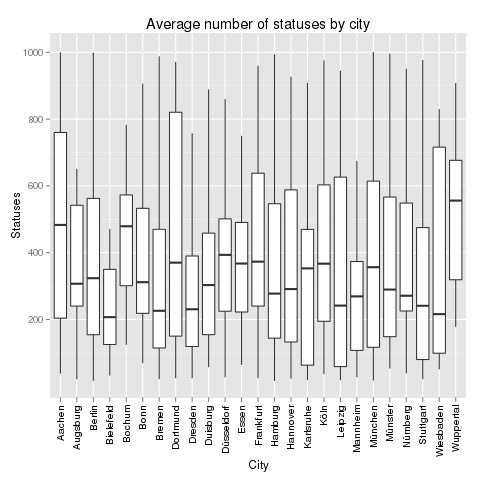 In all three cities, “RT” is the most important word followed by a lot of words like “in”, “the” or “ich” that don’t tell much about the topics. It is much more interesting to look at word pairs (and especially at the pairs with the highest point wise mutual information (PMI). In Berlin, people are talking about “neues Buch” (new book – it’s a city of literature), “gangbang erotik” (hmm) and “nasdaq dow” (financial information seem to be important). In Munich, it’s “reise reisen” (Munich seems to love traveling), “design products” (very design oriented city) and “prost bier” (it’s a cliche, but it seems to be true). Compare this with Hamburg’s “amazon preis” (people looking for low prices), “social media” (Hamburg has a lot of online agencies) and “dvd blueray” (people watching a lot of TV). At first I thought that that data can’t be valid. But looking at the authors I better shut up and simply remain surprised about the outcome. Well, it seems to me your basic argument is: Twitter is moving to Berlin because there the most people using twitter are living. That’s not a surprise looking at the population of the cities. Verdient auf alle Fälle ein Trackback! 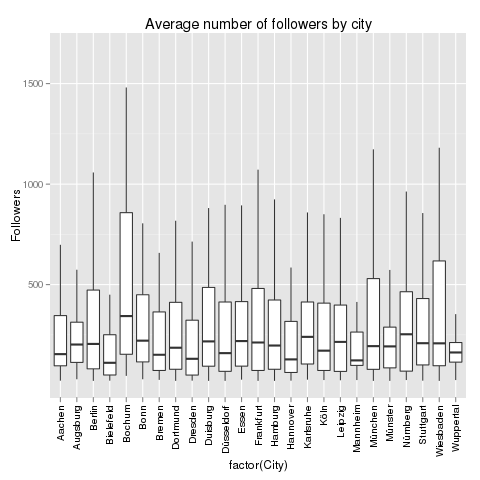 @uelzer I just calculated the regressions: There is no significant relation between the size of the German cities and the number of followers, friends or statuses of the Twitter users in the cities. Maybe I’m blind and missed it, but I can’t find a mention of you looking at actual geo data, only mentions of certain words. Is that correct? 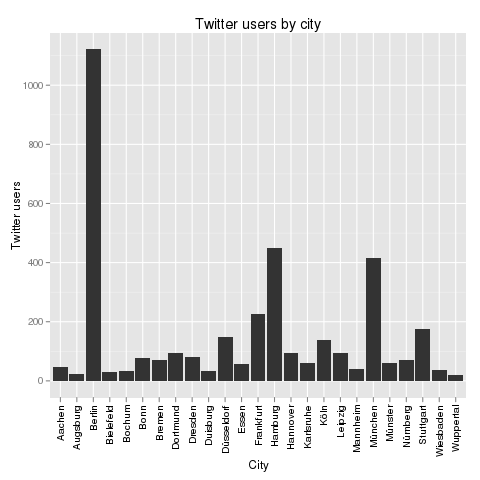 As a mention doesn’t have to correlate with actual location of the twitterer, did you look at where those tweets originated from (explicit geolocation) and where those twitter profiles are registered as at (accounting for national, international and local city name would be interesting too) and see if those numbers align? @uelzer, you quoted the population numbers of 1950. I think, many users note Berlin, Hamburg, Munich as their location whether they only live _near_ these cities. Ich bin gespannt auf weitere Analysen! @Vidar No, I just looked at the location and description fields of the Twitter profiles. Only 1% of the Twitter users that had one of the cities in their location fields have enabled geo-information in their tweets. The relation of people who have Berlin as their geo-location to the people who have it written in their profiles is 1:36.
it is because of the many spammers that Twitter inserted a a barrier at 2,000 following. Twitter only allows you to follow 2,000 people. After this you need more people following you. If you reach 1.820 people following you can reach 2,001 people, similarly: 5,000 follower = 5,500 following, it is a 10% rule. Ich habe noch eine neue Info gefunden.Twitter erlaubt es max. 2001 Leuten zu folgen. Erst wenn man selber 1820 Leute hat, die einem folgen, darf man selber wieder mehr folgen. Es gilt hier eine 10 % Grenze. 1820 Follower= 2001 Following.5000 Follower=5500 Following. Es sollte also der 10 % Abstand nicht unterschritten werden. @Dietmar Thanks a lot! I updated the paragraph in the article. @Benedikt Thanks for the clarification! Interesting insights. That’s a very low number. It would be interesting to see how it compares internationally. Bielefeld is a Joke by veteran usenetters, right? Or did all CCC-Members claim they were in Iran… ehm Bielefeld? thx for this nice introduction into big data. But I do’nt think Twitters decision is based on those data – it’s just the popularity of Berlin in the English speaking world. Berlin has a place in pop culture, and David Bowie and Leonard Cohen did more for that then M. Wowereit. That plays a role in a business with such a high affinity to pop culture. Sure, the data are reflecting that…. Cologne is only the funniest place in an area with tons of middle sized colorless cities + a geographical setting in the heart of Europe.